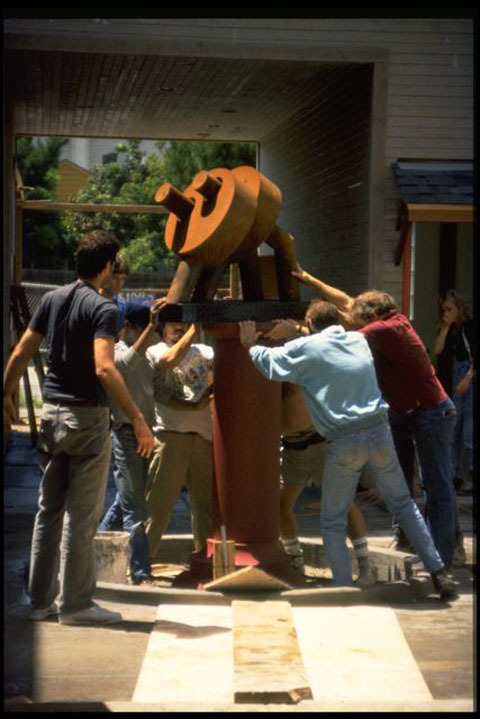 Note: This interview by Pam Strayer was conducted in response to the successful community building already evident in the first few years of occupation of South Prescott Village (designed by Thomas Dolan Architecture), the first new construction courtyard live-work community built in the United States since the Great Depression. Q: Many multi-family and multi-unit live-work buildings are designed with little attention to the possibility that they can facilitate community; what is your alternative to this? 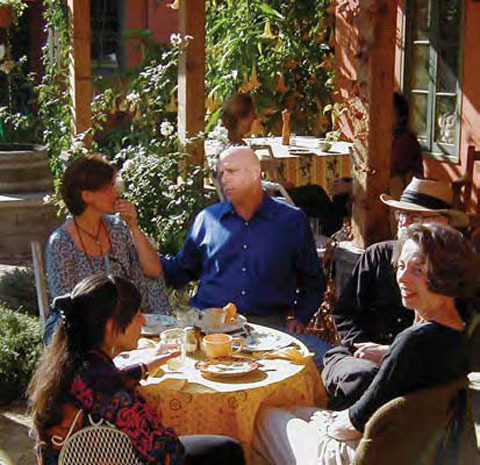 A: Creating spaces in which casual, informal interaction between live-work residents occurs naturally is the most important element in encouraging a sense of community. The nature of those spaces can make the difference between an alienating structure and a fully functioning community. The entry situation—that transition between the moment one enters the complex and the time one closes one’s own door—determines whether one feels a part of something larger, something greater than one’s private, insular, often isolated life. This brief passage, however fleeting, offers the opportunity for interaction, the chance for communication with other residents. This, then, is the starting point of community. Q: How does interaction occur in a multi-unit live-work complex? Meeting at a common destination requires a definite, purposeful intention to go to that common destination (laundry room, garden, pool, spa, etc.) on the part of two (or more) individuals who meet there. The actual meetings are usually spontaneous and casual. Crossing paths are meetings that though never planned, are the result of normal day-to-day comings and goings. Crossing paths leads to interactions that become more or less regular, thereby contributing to a sense of familiarity and even safety. In my experience, the third kind of interaction works best at creating, at a comfortable pace, a sense of familiarity and the kinds of growing acquaintances that lead to a natural, voluntary sense of community. Q: How can the desired interaction that creates community be encouraged? A: Situations can be created that become comfortable settings for interaction as residents cross paths, specifically through the design of how and where people come and go through the common spaces. 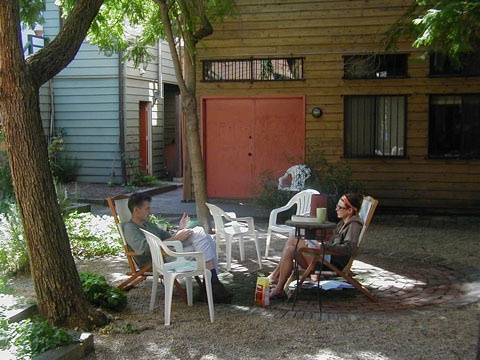 The architect’s challenge is to shape common spaces that are neutral and non-threatening and that invoke a sense of well-being, of comfort in greeting a neighbor, enabling one to pause, chat, and move on.The architect who takes up the challenge of building a community does so knowing that the building itself is half the equation: the residents are the other half. It is through the practice of architecture, what Louis Kahn called “The thoughtful making of spaces that evoke a feeling of appropriate use” that a feeling of communality among inhabitants can be encouraged. When the design succeeds, the result is a functioning community, a union of people and place. Q: Why is the design of a live-work complex such a great opportunity to encourage community? A: The activity called “live-work” is simply a term meaning that most of one’s life is centered in one place (much as farmers, housewives, and villagers have done forever) and that one’s work is often a solitary activity pursued in an isolated space. As distinct from those who work outside of their homes, live-workers are not interacting with peers during their typical workday. They tend to spend their days working alone, or perhaps in close proximity to a mate or family. This solitary isolation in both work and life eventually gives rise to a need for contact with others, a need that is often not perceived until after it has been met and embraced. Q: So, design can facilitate community? A: Absolutely. I have discovered that the special needs and constraints of live-work have created unique opportunities. Over the years, residents of the multi-unit live-work complexes I have designed have remarked repeatedly on a new kind of richness and an unexpected openness in their lives. 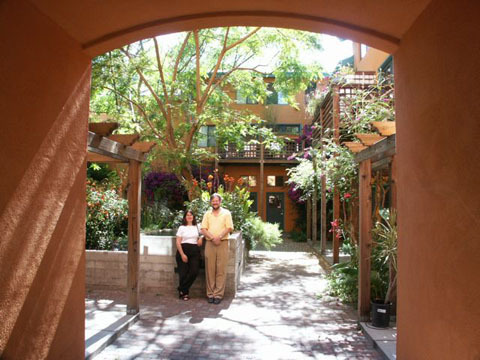 Ironically, many have told me they had no sense of what they were missing until they became part of a live-work courtyard community.The artists of South Prescott Village regard its courtyards and gardens as a fundamental part of their work space—not that they actually use these areas for studio space but rather, their interaction with other artists has exerted a tangible influence on their work (see Figure 5-3). For some, the collaborations that have arisen from such contact with others have changed the course of their work and their lives. Something seems to be working here, something new, and something old: a post-industrial form of socialization, perhaps, or the simple pleasure of meeting at the village well. Those who carry on the activities of both working and living in the same place do more fully inhabit that place: It will ever be thus. 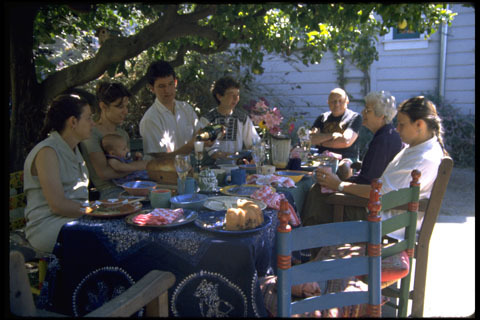 People fully inhabiting a place means a greater caring for that place and for the other people with whom they share it. This may be the great lesson of live-work communities: the rediscovery of the power of fully inhabiting a place, of the well-being that results from it, and of relating to the surrounding community as a community.